Karnival’s fifth birthday featured vinyl vs computer hardware in a delicious back-to-back set that meshed in all the right places for a dynamic and unpredictable set that kept both DJs and clubbers guessing. Karnival at Cabaret Voltaire, Edinburgh, Sat 29 Jan. Dropping a blistering set of bass-centric rhythms, the artist formerly known as Ramadanman kept the dance-floor of the cosy, 100-capacity La Cheetah packed for two hours, showing exactly why he deserved his recent slot on Radio 1’s Essential Mix. 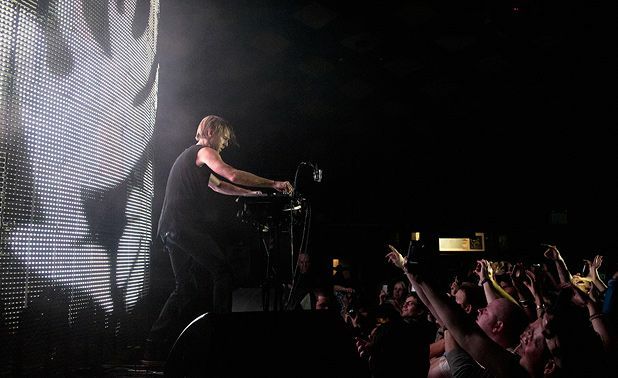 No Sleep at La Cheetah, Glasgow, Sat 26 Feb.
A full on assault of beats, electro, thrash and screaming from the masked duo (and full band) with perhaps the most exhilarating live set coming from this year’s Slam Tent at T.
T in the Park, Balado, Sun 10 July. Jackin’ future house sounds that proved a fitting send off for Ultragroove at the Cab (and also proved why Bashmore is one to watch in 2012). Ultragroove at Cabaret Voltaire, Edinburgh, Sat 20 Aug. You can catch Julio Bashmore again at We Love … Hogmanay, Liquid Room, Edinburgh, Sat 31 Dec.
A late addition but one of the most impressive audio-visual interfaces we’ve ever witnessed as Canadian techno legend Richie Hawtin played selections from his eighteen-year back catalogue made truly awe-inspiring courtesy of the eye-popping visuals and strobes, delivered in-sync across the pulsing LED cage surrounding him.